The Island Crematorium is unique, not only in Ireland but quite possibly in the world. Its location and building offer an experience that makes each service special. We can provide all types of services. The crematorium is designed for religious or non-religious services, simple committal, or full service. You can even use the spiritual space for an end of life ceremony and not use the cremation facilities. We can help you in arranging strewing of ashes or provision of a fitting memorial. We acknowledge that each individual led their own life and that their ending should be likewise. You can discuss your needs with your funeral director or with us directly and we will try to accommodate you as best we can. The surroundings at The Island Crematorium are characterised by the sights and sounds of harbour and open sea, the luxury and warmth, the history and the comfort of silent thoughts provided by the building and its unique spiritual space. Here at the Island Crematorium we keep a book of remembrance where each family can have an entry placed, to remember their loved one. The entry can include family emblem, coat of arms or other suitable logo. 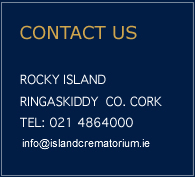 The Island Crematorium is open to the general public from 9.00am to 5.00pm Monday to Friday. Saturday by request. Refreshments available locally contact the office for details.